It's that time of the year again. For marketers, this means reviewing successes from the year and determining where to focus efforts next year. But it's often difficult to estimate budgets for things that you may be doing for the first time, like paid advertising (or increasing your paid advertising spend). So, what are your marketing goals for 2018? More qualified leads? Better followup or nurturing leads to get more in the sales process? A better customer retention strategy? Increased sales? Whatever your goals are, your company website should factor in as an important tool in helping you reach them. A results-driven website must align with your overall strategy. This means allocating time and budget specifically to your website. The question then is - how much should you invest in your website and digital marketing in 2018? New customer acquisition is still a top priority, as it has been in years past. Spending has grown rather significantly for market penetration strategies, which has come at the expense of product/service development strategies. B2B company percentage of total sales via the internet increased to 11.8%, up 1.5% in the last year. Companies are spending 6.9% of company revenues on marketing. CMOs report budgeting for the direct expenses of marketing activities (for example, advertising budgets or costs associated with delivering marketing services) and social media. Digital marketing spending is growing over last year. Conversely, traditional advertising spending for 2018 is expected to be down 2.0%. Mobile is the new "hot topic." Marketing budget spending for mobile is expected to increase over the next 3 years. More companies are expecting to outsource all or part of their marketing, with a 5.1% increase planned in the next 12 months. Use of marketing analytics in decision making is at a high point. Digital marketing capabilities remains an opportunity for most companies. 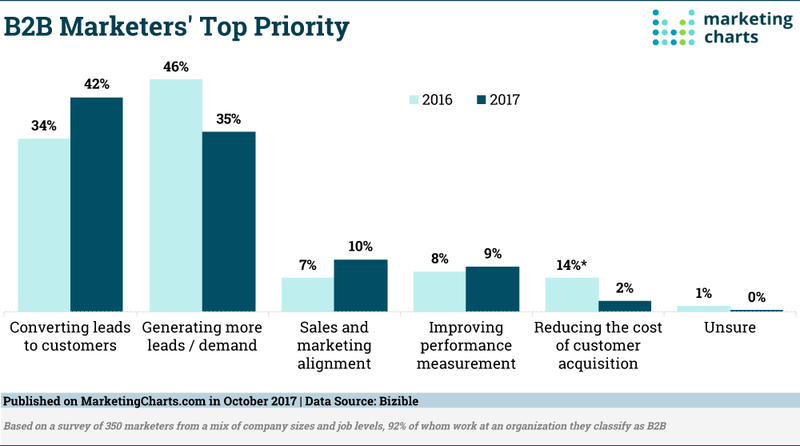 CMOs report that digital marketing, including digital strategy, social media, and mobile marketing activities is a high priority but a large organizational gap. Suggested: Want a customized digital marketing plan for your company? Now let's take a look at things that we at Whittington Consulting believe are items that should appear as priorities in your digital marketing strategy for 2018. Any digital marketing that you do in 2018 and beyond will rely heavily on your website to deliver information and add value to the customer interaction. It's critical that your website be set up for success. There's been an interesting shift in priorities for B2B marketers this year. Rather than focusing on generating more leads and demand, companies are instead putting more focus on converting leads to customers. We strongly believe that any sound digital strategy includes a website, marketing automation software, and a CRM that both the marketing and sales teams can use to drive sales. We currently offer a sales enablement service meant to help companies convert more leads to customers. This came about after hearing sales reps say that their leads were not sales ready and hearing marketers say that many leads are not being worked on. Certainly, almost every B2B company in 2018 could use a third-party look at their sales process and understand how technology might improve efficiency and increase sales. A website redesign requires a great deal of strategy, time, and expertise. The payoff? A lead generating tool that works 24/7 to deliver new business to your company. But, to be frank, it can be a significant investment. Even if you're not planning a full redesign, you should still allocate funds for website updates. One trend we've seen this year is companies budgeting for much smaller projects to incrementally improve their website, like a homepage redesign, content re-writes, etc. These improvements are helping drive more leads and sales. It's important to launch new lead generation offers every few months. These offers could take the form of gated resources, webinars that require registration, or tools like checklists and calculators. Fresh offers on your website give prospects a reason to visit and convert as well as keep current customers engaged. This year, we've seen lead generation offers on your website get shorter. Ebooks used to be a primary resource for lead generation, and new templates, tip sheets and brief guides tend to convert at a higher rate. Webinars are still popular for both service and product-based companies. If your company sees no leads from your website, this is low-hanging fruit for optimization and contribution to the company's revenue. adding new lead generation offers to the library is the best way to accomplish this. In fact, HubSpot's research found that "businesses with 31 to 40 landing pages generated 7 times more leads than businesses with only 1 to 5 landing pages. And the numbers get even more impressive: "businesses with over 40 landing pages generated a whopping 12 times more leads than those with only 1 to 5 landing pages." Building targeted offers to live on those landing pages is what will drive new business next year. If you already have great content available, repurpose it. You know that presentation that you gave at your last conference? Turn that bad boy into an eBook. You will save time as well as costs on the writing/editing side. Search Engine Optimization done the right way increases qualified traffic to your website. However, SEO requires constant attention in order to see the benefits. You can't just "set it and forget it." In today's modern marketing landscape, content is king. Enhance your site by researching new keywords, optimizing website pages based on that research, and writing new content to convert leads. This year, we've written about the concept of "topic clusters" and how they can organize your content to allow search engines to index and rank it better. Topic clusters are the next evolution in SEO, and there's significant work for many companies to catch up to this new trend. Of course, companies should always be building and maintaining links, checking your site regularly for search engine crawl errors, and fixing links that are broken. No one likes clicking a link and seeing the infamous "page not found" error pop up. Broken links prevent search engines from going deeper into your website. Visitors also tend to stop browsing a site once they click a broken link. Broken links can not only negatively impact your search engine rankings, they can create a negative user experience, resulting in lost leads and sales. If you've never run a link checker or checked search engine crawl errors, then the first time could be a wake up call. It may take several hours to correct links each month if you have a large company website. For starters, your B2B website should be connected to a CRM that can not only track customer interactions, but can also store prospect behavior. For example, your marketing and sales teams need to be able to see not only contact information for your opportunities, but also what pages on your website they visit, where the prospect found your company website, what emails they open, what content they download, and what forms they fill out. Your CRM should also be able to identify companies that visit your website, giving your business development team a warm lead list. You can sort through these lists and identify companies that are good targets, then find the right people at those companies to connect with. Conversion Rate Optimization, or CRO ensures that you get the most out of your marketing efforts and your website. Examine: Develop insights based on business goals and market research. 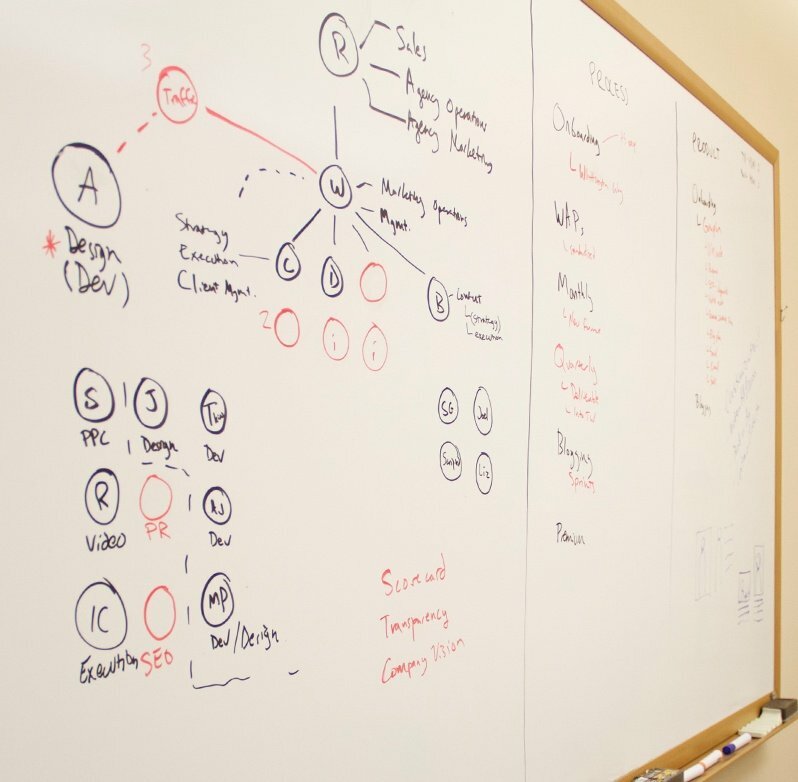 Implement: Create a data-driven CRO strategy with a written plan. 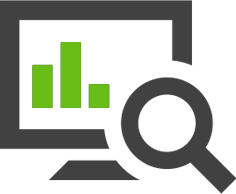 Test: Make changes to your website, then measure the results to a baseline. Verify: Make sure the change makes sense and apply findings elsewhere. Your website could always be improved, even if it's a page at a time. What's holding you back? Keeping your website software (I'm specifically thinking about Wordpress here) up to date has never been more important. As of November 2017, Wordpress runs 59.7% of websites with content management systems. This makes them a target for spammers and hackers. Regardless of your content management system, you need a plan to keep the software up to date so your company doesn't have an embarrassing experience with malware, spam and hackers. Website performance (page speed and load time) is an important factor for SEO. The more pages, images, etc. you add to your website, the more you need to pay attention to optimizing for faster page load time for better user experience and SEO. If you feel like you’re not getting the most from your content management system, you may want to consider migrating to a new content management system in 2018. Digital marketing budgets are increasing for 2018, and you need to be careful to make sure you spend your budget where you'll get the greatest return on your investment. 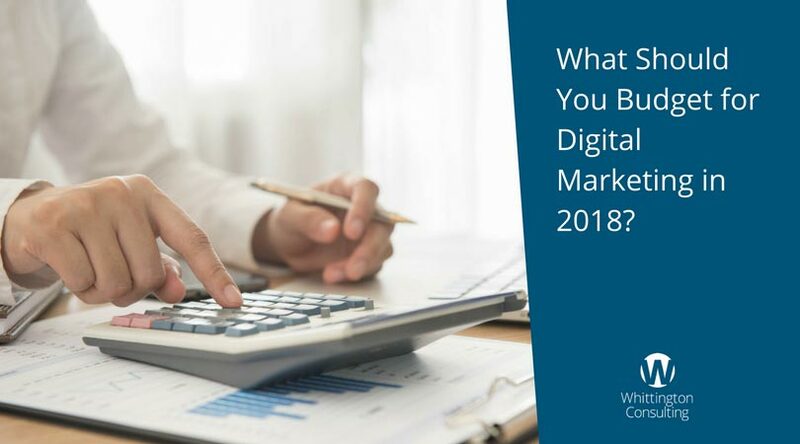 How much as a percentage of revenue will you budget for digital marketing in 2018? If you had to pick 3 top marketing priorities, what would they be and why? How will you measure your results? Note: we recommend setting goals yearly and we made a goal template available for your use here. What internal resources can you tap to accomplish your goals? Do you need to supplement them with other talent? Should you call on a digital marketing firm to help? If you need some help determining what your priorities should be, or if you might want to consider a digital marketing agency to help with your marketing in 2018, we offer a complimentary marketing opportunity review.